Photo courtesy of Don Borin/Stop Action Photography Mercer Island Islanders senior first baseman Justin Ho slides safely into third base against the Juanita Rebels in the KingCo 3A championship game. The Islanders defeated the Rebels 11-1 on May 5 at Bannerwood Park in Bellevue. Islanders clinch berth in the Class 3A state tourney. 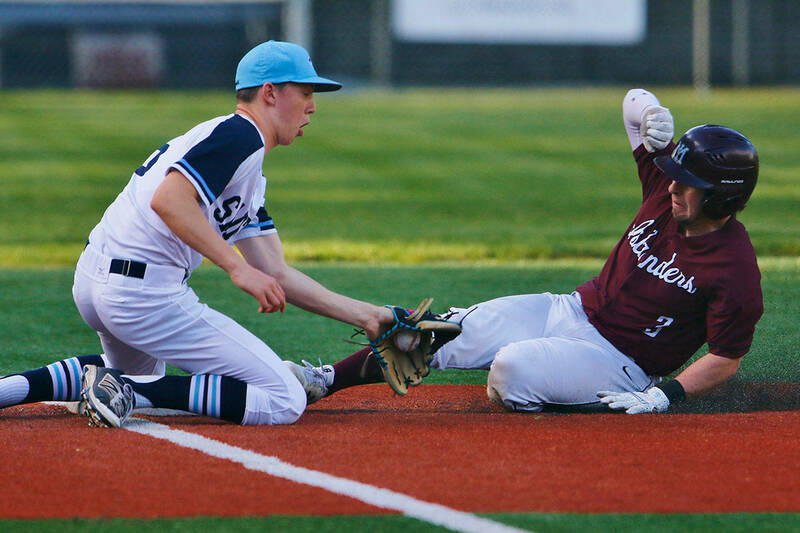 Year in and year out, the Mercer Island Islanders baseball team consistently has found ways to rise to the occasion in the most pressure-packed situations. Why would the Class 3A KingCo championship game be any different? The Islanders dominated in all facets of the game, cruising to a 11-1 victory in six innings against the Juanita Rebels on May 5 at Bannerwood Park in Bellevue. Mercer Island, which improved their overall record to 21-1 with the win, clinched a berth in the Class 3A state tournament courtesy of their triumph in the KingCo 3A title matchup. The Islanders set the tone in the bottom of the first inning, putting up five runs on the board. The Islanders are known for their power hitters in the lineup but they decided to take a different approach in the first inning. Of the Islanders three hits in the inning, two of the hits came on bunts. Islanders’ leadoff hitter Cole Miller executed a beautiful bunt on the first at bat and Greg Fuchs laid down an excellent bunt as well in the No. 3 spot in the order. The Islanders sent 11 hitters to the plate in the first inning. Islanders’ starting pitcher Robert Weaver pitched all six innings, allowing just one run and six hits in a dominating performance on the bump. Fuchs, who went 3-for-4 with three RBI, can’t wait for the Class 3A state tournament to begin. “I’m really stoked for these guys. We have a lot of experience on this team, so I feel very confident going into the state tournament. It is going to be a great way to end the season and we’re hoping to do something big for Mercer Island,” Fuchs said.